What a sense of comfort and relaxation you can enjoy when there is truly a place for everything in your closet. Whether you have an expansive walk in closet in a luxury home or a small reach in closet in one of the kid’s bedrooms the right closet organizer accessories can make it quicker and easier to find things. See the broad array of options below from the Innovate Home Org line. Whether you need a tie, belt or scarf rack, an organized jewelry drawer (and what women wouldn’t love this), a convenient to use hamper, basket or ironing board and an organized place to store your shoes you’ll find options to make your life easier here. This belt rack will pivot up to 90 degrees and you can store either 7 belts or ladies scarves. This tie rack pivots 90 degrees making very easy to find the perfect tie for today’s business meeting or event. A perfect place to put up to 7 scarves. It pivots 90 degrees for easy access. This panels pulls out from your cabinetry to reveal a place to hold belts or scarves. Very clean and smart styling. This rack slides in and out to get to your belts with ease. Provides simple access to your ties with it’s sliding function. This oil rubbed bronze can add a distinctive and elegant touch to your closet. 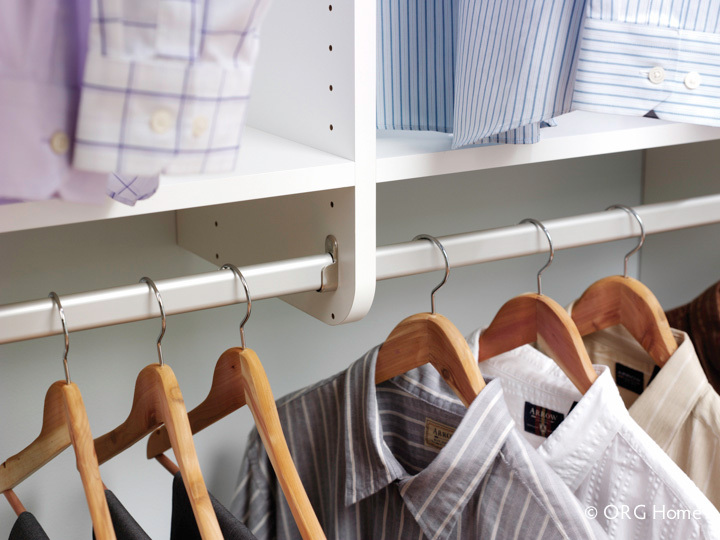 This rod will extend from the closet to not only add space but can display tomorrow’s outfit. It’s nice to know you’re not limited to one location for your rods. The location of the rods can be adjusted to fit your seasonal clothing needs. If you’re not as tall as you’d like or are in a wheelchair you’ll appreciate the convenience of the pull down wardrobe rod. Now you can get to everything in your closet irrespective of your height. Whether your jewelry selection is large or complete with some expensive items Innovate Home Org has options to keep it organized and safely stored. There are options to suite the most discriminating woman and neat and fashionable man. Keep your jewelry organized with the velvet tray. For more valuable items there is an optional locking feature. This two level jewelry tray has a velvet lined bottom and an acrylic top tray for even more storage. This mini jewelry tray is excellent for the fashionable man in the family who wants to stay organized. There are separate compartments to put a wallet, rings, phone and a wallet. This feature is perfect for a woman with a lot of earrings, necklaces and rings. This 2 level slide out jewelry tray is velvet lined on both levels and is hidden behind a drawer front. Smart storage and it is smart looking. Storage solutions are not all created equal. Your needs are as individual as you are. At Innovate Home Org our goal is to provide you with options which make your life easier and reduce stress. You can save time with a pull out ironing board, enjoy your neater closet with dirty clothes hamper which are hidden from view or keep bulky items like toys and balls off the floor in the kids room with wire baskets. Imagine how nice it would be to not have to trek down to the laundry room to press some paints or iron your blouse in the morning. This pull out ironing board swivels for use and then can be folded up and discreetly stored behind a drawer front. It’s nice to be able to see your towels, sweaters or shirts at a quick glance. These wire baskets are versatile and visually appealing in an upscale closet organization system. Say goodbye to ugly laundry bags on the floor of the closet. Maintain a clean minimalist vibe with this closet hamper which keeps your dirty clothes out of sight. Keep your daughter or son’s bulky toys, balls, sweaters or shirt more organized – yet in sight – with a wire closet storage basket. These baskets can get moved up in the closet design as the kids get older. 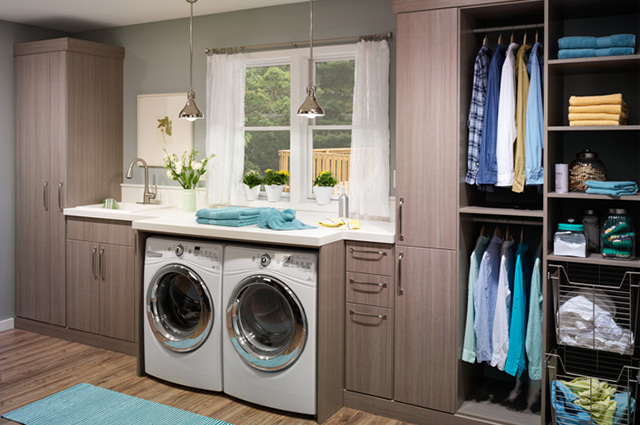 These dual bins provide another solution for a laundry hamper or additional storage. Elegance can be felt in the opening and closing of a well constructed drawer or in the look of finished molding, shelving or countertops which can compliment your home. 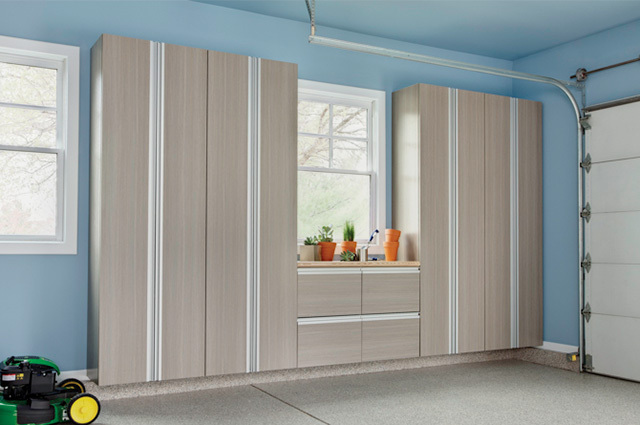 See how these options can add values, style and additional useable space for a walk in or reach in closet. The woodgrain drawerboxes with a vinyl finish provide a higher end look. 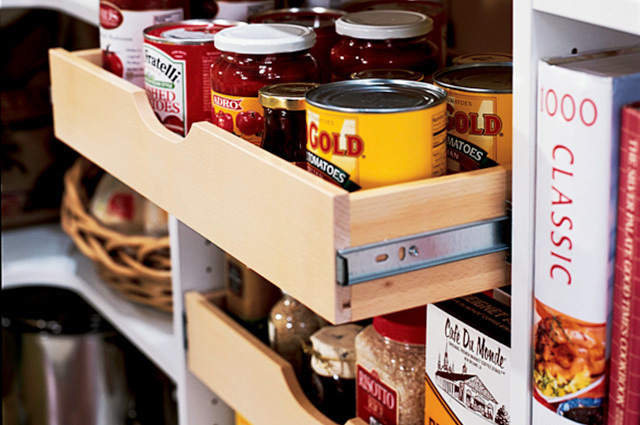 The fully extending glides make it easy to find items in the back of a drawer. This high quality drawerbox is built to withstand tough day to day use and the full extension glides allow you to find items in the back. There is nothing quite as distinguished looking as finished moldings (crowns, dentil moldings, rosettes and flutes). They create the finished look for a traditionally upscale home. Just like the usefulness of the kitchen island the walk in closet island can provide additional storage (for shoes, sweaters etc.) and it offers a finished surface to lay out clothes for tomorrow’s important event or business meeting. Enjoy the benefit of long uninterrupted shelves to maximize space and thick countertops (which are also engineered with the environment in mind) by using the new Forterra line in your walk in closet design. You should be able to see how you look and be able to differentiate between colors all while staying in the privacy of your closet. Our lines of mirrors and lighting can help. This mirror is concealed in the space needed for a hanger and pulls out to provide you with a full view. Slide out this closet panel and a full length mirror appears. What good is a luxury custom closet if you can’t see anything? Adding lighting can vastly improve your experience with getting ready for a work or a big event.